With the introduction of the myStarbucks and Starbucks Card Mobile apps for iPhone I was hired by Blast Radius Vancouver to create a playful feature video for the Starbucks corporate website. Starbucks wanted the video to explain all of the features of the app in one consistent narrative and also introduce customers to a new mobile payment system. The two apps were just nearing development so this animation required the creation of a video prototype that would look and feel exactly like the final app. Initial styleframe of graphic approach. This project already had a first draft of a script when I was brought on board. It was my job to make sense of a number of features, help refine the script, establish a visual look/feel, and compile typographic callouts. I had been given bits and pieces of the app and worked with James Bartley and Derek Pante to establish the texture and treatment. Storyboard frames from the original concept. We had originally looked at options to have an actor navigate through each screen but because the app was not complete we decided to create everything digitally. Each of the screens were recreated and animated to the exact spec of the final app, with mimicked iOS scrolling, scaling, and button activation gestures. The animation launched in the US and a few months later we we-authored another version for the UK. 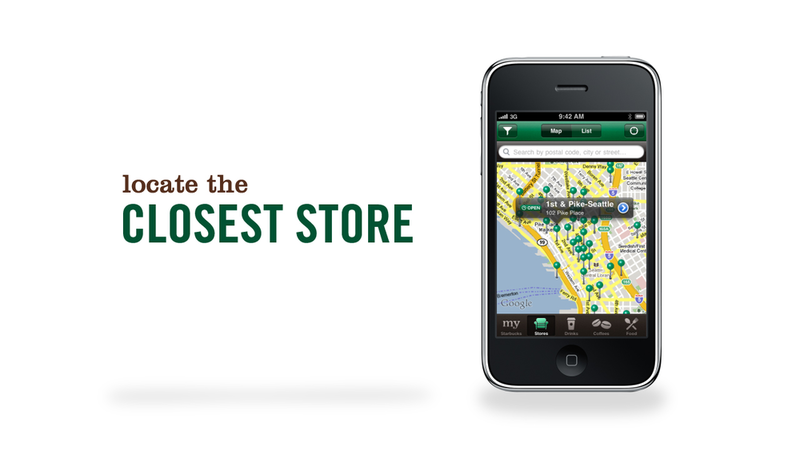 The Starbucks Mobile Card app is now accepted throughout the world and used to both find locations and make in-store purchases.